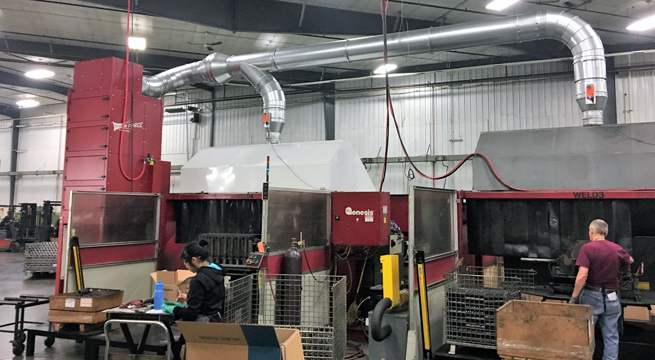 Large Tier 1 automotive supplier with 120 robotic welders is kept clean, and free of hazardous weld smoke and fumes utilizing 22 each RP8-2, 16 cartridge collectors, installed on mezzanine over robotic weld cells. 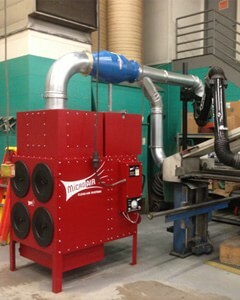 MICRO AIR FRP8 ducted to two large robotic weld hoods. 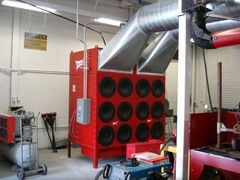 Each hood is equipped with an electric duct damper that opens only when weld station is in use. 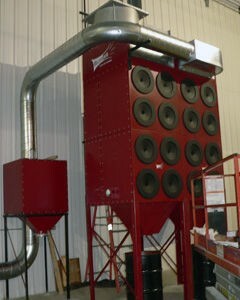 Micro Air® RP1 Twisters ducted to four grinding stations capture dust and particulate, providing clean, safe breathing zones and shop floor. MICRO AIR FORCE FRP8-3 equipped with custom legs to accommodate 7 ft x 7 ft roll-in dump cart captures fine, fibrous wood particulate in woodworking shop. 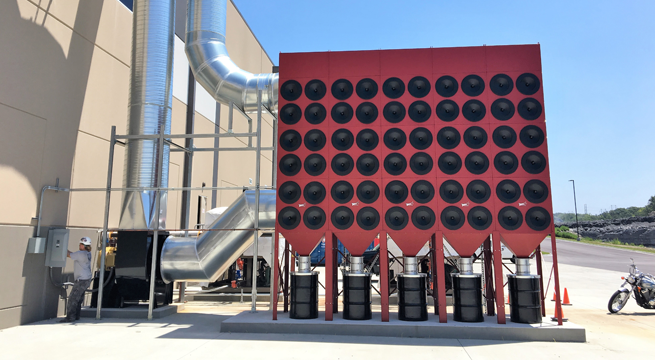 Micro Air® dust collectors are engineered from the ground up with innovative design, and features that provide what counts most in a dust collector: functionality. 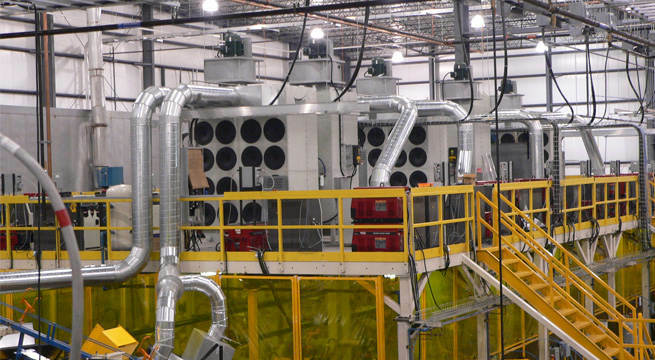 From fine dust to coarse particulate, we can help make your plant a Breathe Easy, cleaner and safer work environment. 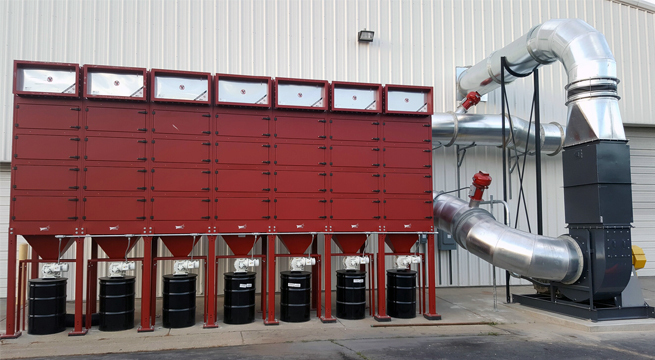 Micro Air® dust collectors utilize cartridge filtration and are available in a large range of configurations to meet the requirements for capturing harmful contaminants generated in a multitude of industrial processes. Modular design provides ability to bank units together for virtually an unlimited number of cartridges. 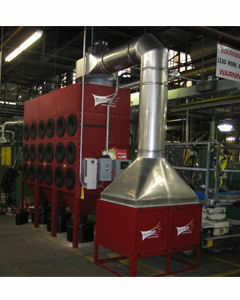 All are designed to meet OSHA / NFPA and Industrial Ventilation Standards and are sized and rated for the proper air-to-cloth ratio to solve clean air issues in a wide variety of applications such as welding, grinding, laser cutting, plasma cutting, abrasive blasting, pharmaceutical, chemical processing, thermal spray, mixing etc. Key to our models is a revolutionary cleaning system called Roto-Pulse®. 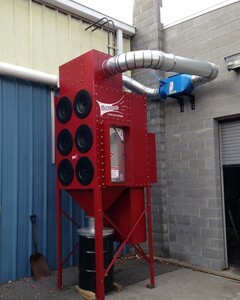 This is an on line system that continually cleans the filters with a revolving, compressed air driven, tube. As air enters the tube, the force of the pulse causes the tube to rotate incrementally inside the cartridge. While rotating, air exits the pre-drilled holes in the tube. The result is that air hits the entire inside length of the cartridge, pulsing dirt particles away from the filter for a much more efficient cleaning cycle, thus extending filter life. 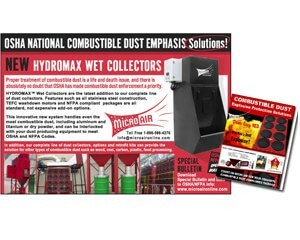 A small footprint of only 42" x 48" allows Micro Air® dust collectors to be located in virtually any area. 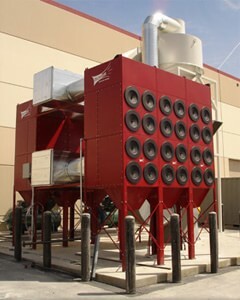 We can design and provide a complete dust control system including the collector, ductwork, spark arrestance, safety filters, Intelli-Touch™ Energy Savings controls, along with any ancillary products required for OSHA / NFPA compliance such as explosion vents, backblast dampers, high speed abort gates, rotary airlocks, screw conveyors, chemical isolation etc. This is your assurance of the best possible total system, for your particular application, and supplied from a single source. At Micro Air we take great pride in our outstanding line of products, manufactured in the USA, and in our unsurpassed quality and customer service. 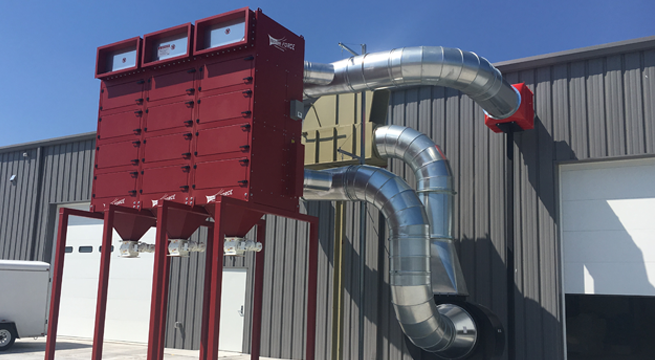 In addition to our full line of dust collectors, the model RP dust collectors and model FORCE™ dust collectors, we offer a full range of replacement filters for our current collectors, as well as aftermarket filters for replacement in competitor collectors. Micro Air® RP1 Twister™ single cartridge, 1000 CFM collector is the ideal choice for capturing contaminants in welding, grinding, routing, or bag-filling stations. RP2, our dual cartridge portable collector is your choice when you're looking for a small portable collector with all the Micro Air® built-in features such as RotoPulse® cartridge cleaning system that diversifies your cleaning capabilities. 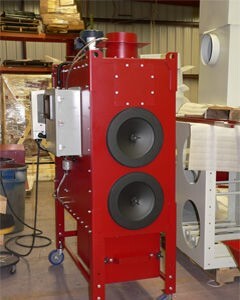 RP4 ducted to belt grinder operation refurbishing stainless steel elevator panels. RP4 captures dust and particulate generated. This area is now compliant for acceptable PEL limits for Hexavalent Chromium. 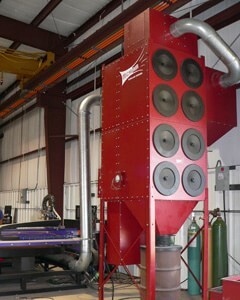 RPO6 ducted to multiple grinding stations. RP8 Captures smoke and fumes from plasma cutting table. RP8 installed on mezzanine, ducted to multiple stations. 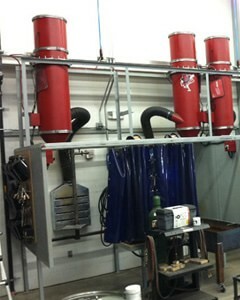 RP6-2 ducted to multiple downdraft tables and source capture arms in a weld school. RP6-3 with SF400099 Safety Filters on a lead dust application. 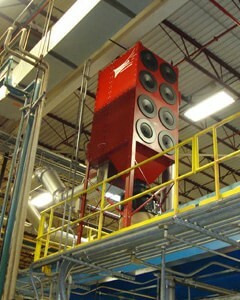 RP8-2 with SA4000V spark arrestor ducted to multiple grinding stations. 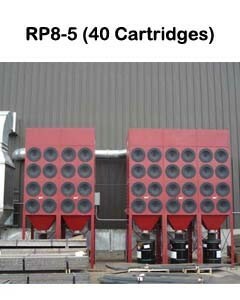 Dual RP8-3, (48 cartridges) installed back to back with cyclone prefilter for heavy chips. 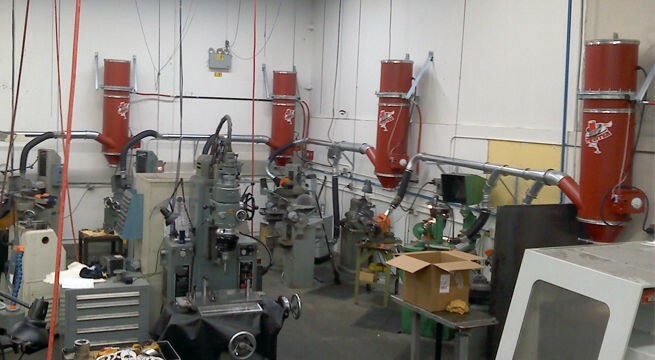 RP8-3's are ducted to saws, sanding tables, etc. in large woodworking shop. RP8-5 (40 cartridges) Laser Tables. SF400099, equipped with 99.97% efficient HEPA filters, provides increased protection, providing back-up filtration in the event of primary filter failure, and returns clean, safe air back into the plant. 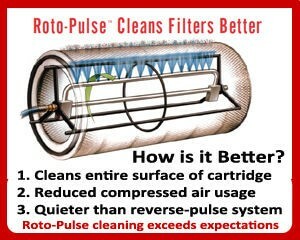 Micro Air® revolutionary Roto-Pulse® Cartridge Cleaning system extends filter life by cleaning the entire length of the cartridge, while using less compressed air than traditional reverse-pulse cleaning systems. 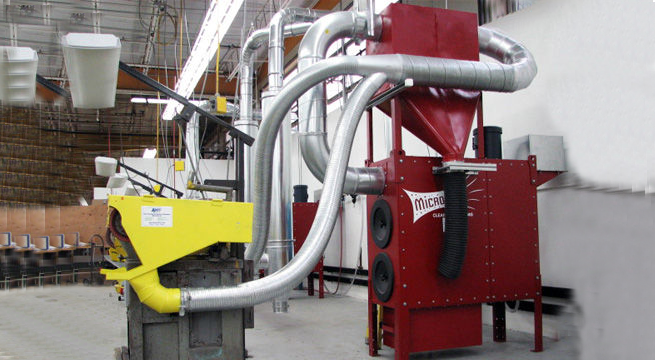 Micro Air offers a complete line of dust collectors and options for explosion vents, backblast dampers, quenchers, chemical isolation, etc, everything required for NFPA and/or OSHA compliance. 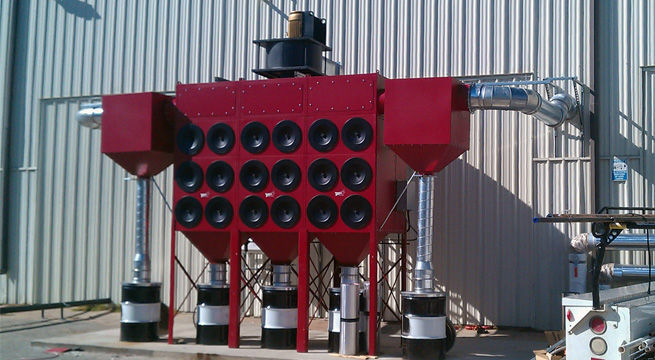 Micro Air® can provide the solution for all types of combustible dust such as wood, coal, carbon, plastic, food processing, metals etc. Micro Air's factory-trained network of Engineered Systems Distributors can assess your needs and design safety and compliance into your collection system.